When it comes to the corporate world, one thing that cannot be avoided would be meetings – and having said that, meetings in the modern world has long ditched blackboards with white chalk, but rather, depend on sleek PowerPoint presentations. The traditional whiteboard too, has been replaced by electronic whiteboards, and Sharp would like to expand the reach of its corporate offerings by revealing a pair of AQUOS BOARD interactive display systems, which are better known as the 70″ Class (69.5″ diagonal) PN-L703W display and the 60″ Class (60.5″ diagonal) PN-L603W display. These two premium models will arrive with built-in wireless capability, allowing for an unprecedented level of secure collaboration. Arriving in both a 60″ Class and 70″ Class model, the premium-grade line AQUOS BOARD interactive display systems have been specially designed for use all week long without a break – perfect for companies and organizations that are on the cutting edge of things and would like to ensure that work gets done regardless of the time of the day. 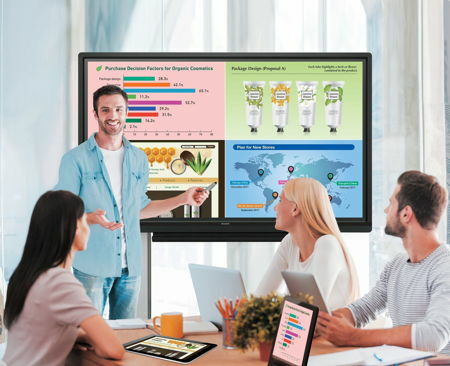 With its integrated wireless technology, it is a whole lot easier to conduct efficient, collaborative meetings as users present content on the AQUOS BOARD interactive display directly from their mobile devices without the need for adapters, cables or even pre-installed software. These displays’ wireless capability will allow the transmission of video signal, as well as boast of the ability to wirelessly transmits the audio signal and even the touch signal. Not only that, it will assist in creating a more secure environment through the broadcasting of its own wireless hotspot in order to avoid accessing the corporate network. Working seamlessly with major mobile platforms including iOS, Android, Windows and OS X, cross platform independence is ensured, while Chrome browser support will be arriving some time later this year as well. There is a 2 x 2 Split-Screen mode that lets up to four people wirelessly transmit their mobile screens to the AQUOS BOARD interactive display at the same time, making it a snap to present various facts and information simultaneously. There is no word on pricing as at press time though.